London Towers was a professional basketball team based in London, England. They enjoyed some success in the 1990s, collecting 3 titles in the British Basketball League (BBL) as well as regularly competing in European competitions such as the Euroleague and EuroCup. They contested a fierce rivalry with fellow London team Greater London Leopards for much of this spell. After several years of decline with financial difficulties and venue issues, owner Costi Zombanakis pulled the first team from the BBL in the summer of 2006, and although the team continued in the regional English Basketball League, the London Towers brand folded in 2009. Established as Tower Hamlets, in the borough of the same name, the London-based team entered NBL Division 2 in 1984. By 1989 they finished eleventh, out of the eleven teams in the league and were due to be relegated. However, the Carlsberg League Division 1 was suffering a membership crisis at the time and was about to be reduced to just seven teams. With the newly built Docklands Arena available as a possible venue not too far from the team's base, the Tower Hamlets franchise was admitted to country's top professional league as London's representatives, rebranded as London Docklands for the 1989-90 season. The following season the Docklands team left the giant arena as they, in common with other basketball teams at the time, struggled with the cost of a big arena rent. They returned "home" to Tower Hamlets and the Newham Leisure Centre, although their first two seasons yielded just three League victories. It was 1991 when the franchise which came to sit astride British basketball finally gained its most well-known label. Renamed London Towers, but still playing at Newham the club's fortunes turned around in the 1991-92 season, as they finished fourth, and a move to the Sobell Sports Centre in Islington saw them finish third in 1993. In 1994 they moved to Wembley Arena, and it was there that they enjoyed their best seasons, winning five titles in two seasons, from 1995 to 1997. The 1997-98 season saw the Towers make the European debut appearance, competing in the EuroCup, however all did not go to plan and the London team were shamed with a 1-9 record in Group E, finishing in last place. 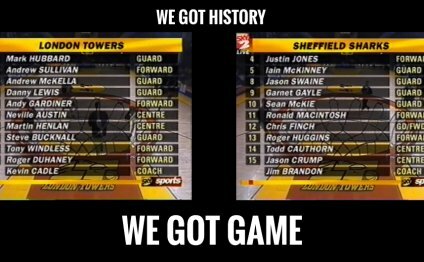 The Towers made another appearance in Europe in 2001 when they took part in the prestigious Euroleague, but again the Towers collapsed with a 0-14 record, good enough only for 8th place in Group B. Once more though, in 1998 the Towers home venue proved too expensive and the team moved out of Wembley, "merging" with fellow BBL team Crystal Palace and splitting games between the two arenas until in 1999 they moved full-time to the Crystal Palace National Sports Centre. Plans for their own Arena, linking with their community and development work, had been rumoured for several years but in 2006, the London Towers first team pulled out of BBL, for a "one year break". As a result, the second team London Towers II continued to fly the flag, competing in the English Basketball League Division 3 while still operating all of is youth and development teams. Such a step had also been taken in the past by both Manchester Giants (see Manchester Magic) and Derby Storm (see Derby Trailblazers) and neither has yet returned to the top league. The deadline for entry into the 2009-2010 English Basketball League had closed and London Towers failed to submit a team, therefore there will be no senior men's London Towers team for the foreseeable future. Assistant Coaches - Tony Garbelotto, Graham Wilson, Alex Fuhrmann, Darren Johnson, Julian Martinez, Joe Lofthouse.